PRESS RELEASE: Blues Against Hunger Society, along with Aztec Brewing Company, present an All-Star Blues Jam Invitational benefit food drive concert for North County Food Bank. 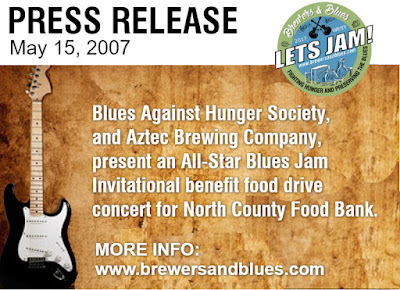 Blues Against Hunger Society, along with Aztec Brewing Company, present an All-Star Blues Jam Invitational benefit food drive concert for North County Food Bank. 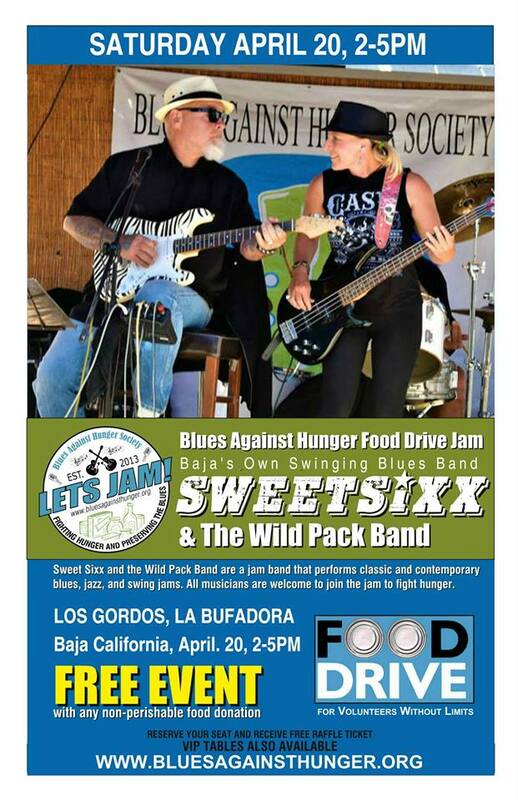 SAN DIEGO, MONDAY MAY 15, 2017 - The Blues Against Hunger Society (BAHS) is presenting "Brewers & Blues Against Hunger All-Star Jam," a benefit blues jam concert to support North County Food Bank. The concert will take place at the Aztec Brewing Company at 2330 La Mirada Dr. Suite 300 • Vista CA 92081, on Wednesday June 14 and begins at 6:00 P.M. The concert has performances of some of the genres most important and memorable blues songs by a collaboration of San Diego county’s blues stewards including Big Al Schneider of Chris Fast Band, Chet Cannon of Chet Cannon and the Committee, Stoney B. of Stoney B. Blues Band, Michele Lundeen of Michele Lundeen & Blue Streak, The Fallbrook Kid Anthony Cullins, Martin F. Tramil of Martin Tramil and the Jamm, Zack Cole on harmonica, guitarist Arthur "Arturo" Cardenas from Tijuana Mexico, guitarist and bandleader Chill Boy, multi-instrumentalist Karl Dring on Blues Harp, Guitar, and Bass, and hosted by Sweet Sixx and The Wild Pack Blues Band. The Brewers & Blues Against Hunger events are always FREE to the public and all are encouraged to donate nonperishable food items to support the work of North County Food Bank. 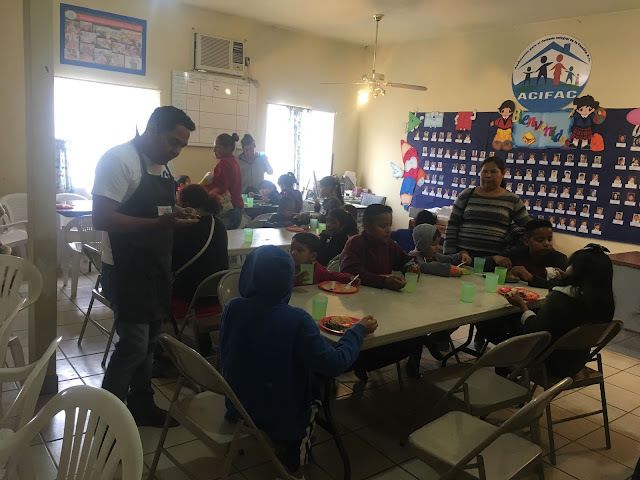 "We learned how music and meals can heal." said Sweet Rachel, "Now it seems it’s all we want to do; we love the blues, and the reward of doing what you love while help others is overwhelming." All donation will be accepted at the door in provided food bank containers. The goal is fill the community food bank and fight hunger while sharing the passion of blues and artisan of fine craft beers. In addition to food drives, and a celebration of blues, the jams are also a celebration of craft beer. 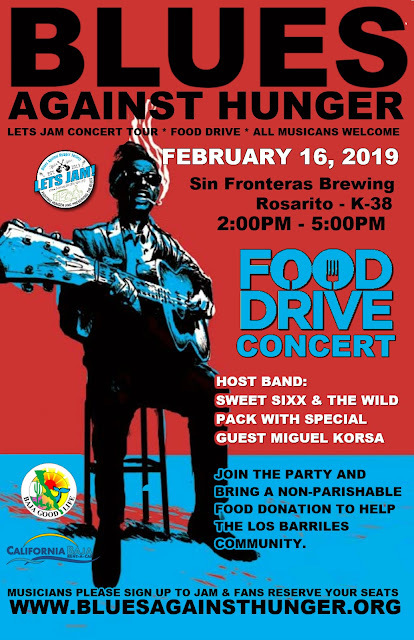 Aztec Brewing Company is the host of the Vista California jam. The brewery is little bit of nostalgia and a little bit of new life. Although they’re working to revive an old-style brand, they are also working hard to be conscious of the importance of being green and natural. “Savor the flavor before you taste it”, as they say. From a good kick back beer, to a beer that will kick back. Craft brewers and blues musicians are both artisans, unique, and special unto themselves, and when paired together great things can happen. Please help fight hunger and preserve blues music. 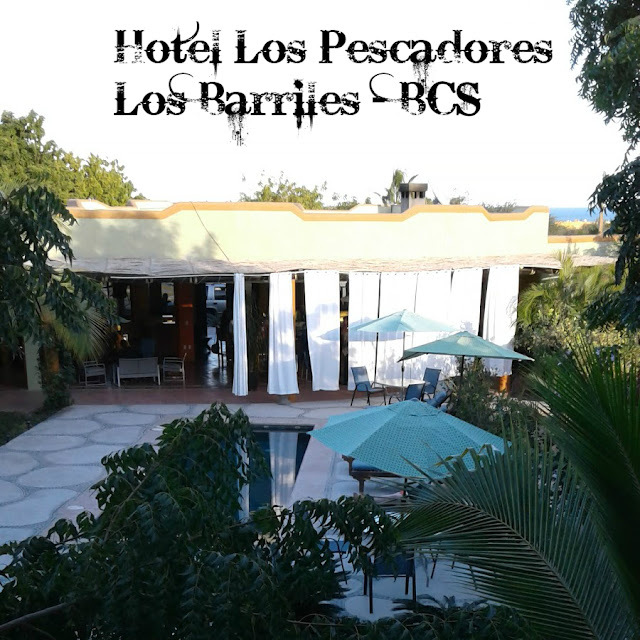 Music and meals can heal, and you can be part of it too!" 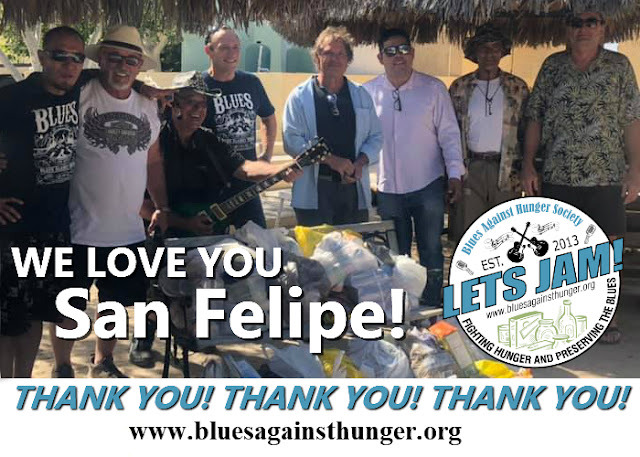 BLUES AGAINST HUNGER SOCIETY produces two annual blues food drive tour campaigns: BREWERS & BLUES and BAJA BLUES TOUR.